Posted on 20 June 2014. High in the Mayacamas Range, at an elevationof 1,700 feet above the Napa Valley floor, sits Spring Mountain and the Robert Keenan Winery and vineyards. Join us for an unforgettable evening of food and wine featuring the President of Keenan Winery and son of Robert Keenan, Michael Keenan. 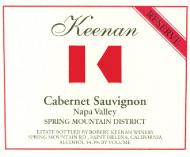 Keenan Vineyards produces some of the most highly rated wines from Spring Mountain, wines of unparalleled complexity, richness and elegance. Learn the history of the winery, taste the latest extraordinary releases and meet Michael Keenan, one of Napa Valley’s acclaimed producers! Seating is limited, so please be sure to RSVP early before it sells out!